Day 10 on the Makeup Savvy 15 day nail challenge is gradient. I take this to mean that your have a change from one colour to another working its way down the nail and you can have this either in different colours, varying shades of the same colour. I've never done this before, but I've seen it plenty of times, and knew the way to achieve it was by dabbing colour on with a makeup sponge. I'm not all that pleased with the result to be honest, I think I put too much colour on the sponge which has given quite harsh lines between the colours and sort of defeats the object of using the sponge! 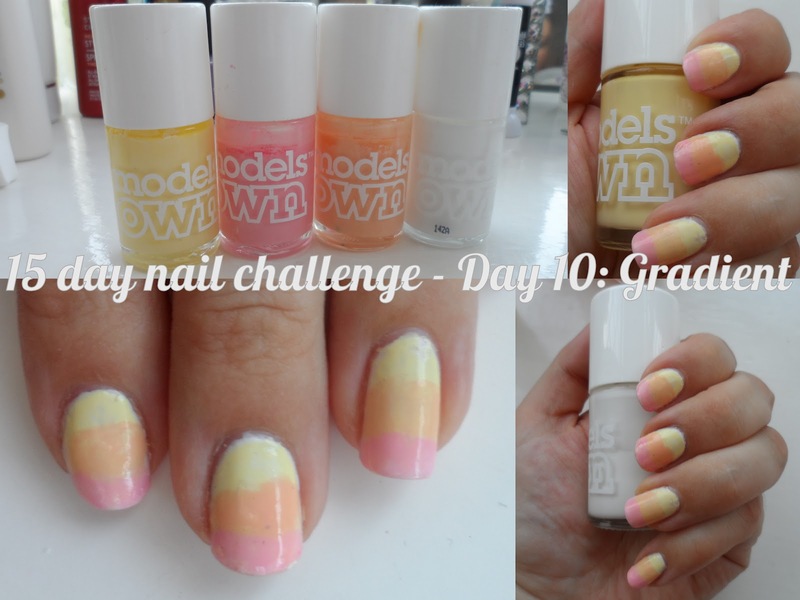 The colours I used for this are all from models own - for the base snow white, and then lemon meringue, fuzzy peach and pastel pink. Tomorrow the challenge is metallic nails - I'm going to a wedding tomorrow too, so hopefully I can come up with something that will go with my outfit (it would help if I'd decided which dress I'm wearing too) so that I don't have to change my nails twice in one day! If you want to join in with the challenge (you don't have to do all 15 days! ), have a look at this post from Fee which explains it all. I love these ones too, love the shades you have used. I love the Ombre style so much easier to do than a lot of other nail art, I'll have to try these lighter shades out I did have a go of this using darker shades.